The Masada semi-automatic pistol is the product of Israeli Weapon Industries, (IWI) Ltd. 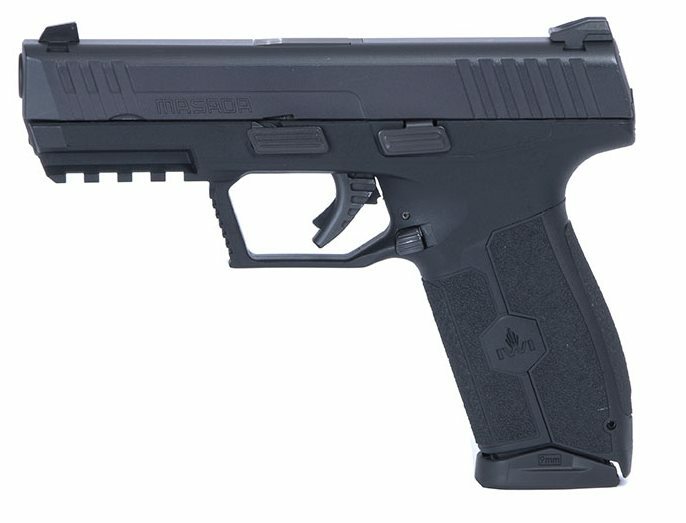 This pistol was announced in 2017 and released in 2018. The IWI Masada handgun is a short recoil operated, locked breech (Browning type) pistol. It features a fibreglass reinforced polymer frame with removable steel insert carrying the trigger parts and slide rail, which is the main serialized part. Trigger pull is between 5.5 – 7lbs (2.5-3.2kilos). The trigger is striker-fired, with pre-cocked spring and automated trigger safety. The pistol is unable to fire unless the trigger is pulled. There is also no need to pull the trigger when dissasembling the gun. The frame features removable grip panels in three sizes. Magazine release and slide release controls are ambidextrous. Magazine capacity is a healthy 17+1 9×19 rounds, featuring a visible round count. The weapon also has a loaded chamber indicator and integral MIL-STD 1913 picatinny rail.